In the Radio 4 programme ‘Just a Minute’, given the word speak about ‘Rotary’ we wonder if Child’s Play and Birthdays would come into the usually hilarious presentation or would the buzzer go to indicate deviation? Our Face2Face meeting at Lily & Lime LD on Saturday 9th June, was just that, celebrating President Janice’s birthday with carrot cake and all the delights from this excellent Social Enterprise Cafe. 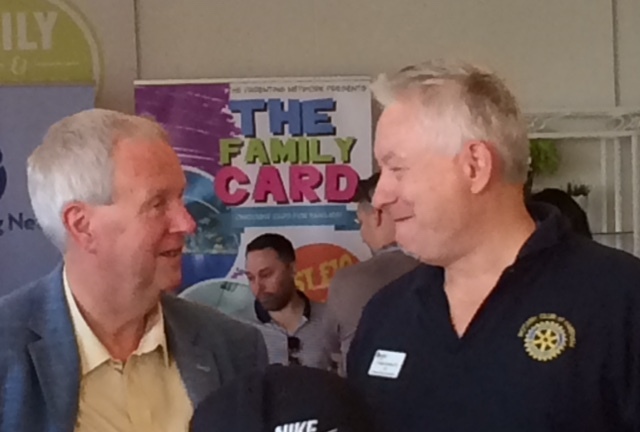 Whilst members discussed and shared project ideas, business networking and learning more about The Parent Networking (Facebook page) and Family Card which is taking off in a big way in Portsmouth. The highlight of the morning was all the children just having lots of fun together, playing with the toys and using the display table as a secret den to concot lots of secret plans! 21st Century Rotary involving the whole family having fun and developing ideas, no bling or bells, just the Magic of Rotary at its best. It was great to have our Treasurer there and, as it was another special birthday, in the Queen’s Birthday Honours we heard later that David had been awarded the MBE for his services to Hampshire. We congratulate him on this award. It was exciting to see the first meeting of the Rotary Social Innovation South Wiltshire held in Amesbury this week. A little more formal than our Face2Face on Saturday, we did adapt a dinning table with a cloth, to serve delicious cakes and coffee, as we chatted and planned the way ahead. In such a short time 30 people have shown their interest in joining this new initiative as our first Satellite. 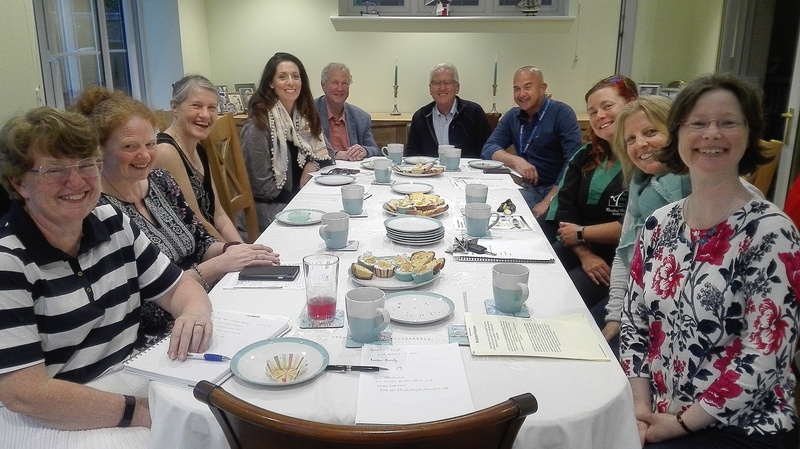 We are delighted to be supporting local Social Enterprises, Charities and initiatives in the South Wiltshire area and have plans to hold Face2Face meetings on a monthly basis. This development has given us real encouragement to venture forth again into East Hampshire and we are starting to make contacts in the Whitehall & Bordon and Petersfield to find people interested in joining us. In just under a month we already have 3 members and lots of enthusiasm to get this underway. putting the Social Model of Disability as a major plank in how we want to help build sustainable communities. encourage people to share ideas, develop new initiatives, involving the whole family in helping to undertake activities like preserving our environment and encouraging community service through Interact Clubs in Schools. We have a great team who are involved in a number of new initiatives being considered e.g. helping to develop a Community Garden, exploring the possibilities of running Soup events, exploring how we can help with Stroke Awareness, how we can involve different ways to use music. Pictured above Leon at our Face2Face is passionately sharing his ideas, as he has become our Community Service Coordinator after attending the District 1110 Assembly. He is very keen on environmental and social issues, for which he is holding a meeting on the 30th June to look at Stroke Awareness and how in partnership with others we may help. His business is very supportive of Community Social Responsibility and anyone stuck for a good idea for Father’s Day the Bungee Spongee is an ideal gift if they are into boating or cleaning cars. Lots of ideas, a chance to network and share the delights of soup made by The Pantry Partnership. 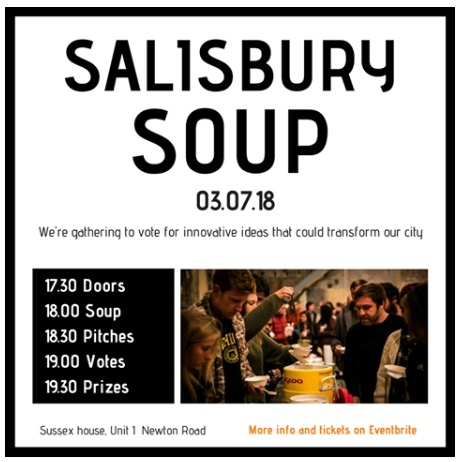 We encourage you to book your place on Salisbury Soup to be held at Quench, Salisbury. 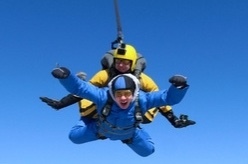 Although there are no flies in the soup, flying was a definite topic at our South Wiltshire Face2Face meeting, as many are taking part in the Alabaré Skydive. So as you can see in Just a Minute you can connect with our new flexible and innovative way of doing Rotary which offers lots of new connections for your business or community work. Opportunities to be creative, share good ideas and, above all, make new friends, plus, if you choose, get the whole family involved in fun activities. Finally to stress again we are Rotary for busy people, we do so much online and this includes our ongoing eCampaigns from Dolphin’s Den, Toilets and Christmas Puddings, all of which can be discovered in these pages. Our Rotary is full of variety and we are not just talking about what’s in a famous brand of soup!